Since this came from the senator’s official Facebook, I’m assuming he did say this (one of the difficult things about the Internet is it is difficult to verify the authenticity of quotes). A share (or proportion) of a portion is determined by (X/Y), where X is the portion in question and Y is the total. If X increases and Y increases at a faster pace, then X’s share falls. It does not mathematically follow that X is smaller (although that is sometimes the conclusion drawn, as in this case with the senator). Second, the senator heavily implies that, in 1955, there was no budget deficit. According to the US government, this is categorically false. Budget deficits have been a facet of American politics for many years, including 1955, and they appear regardless of tax rates. In fact, there is almost no relationship between tax rates and taxes collected (as % of GDP). Regardless of where the tax rates are, revenues have hovered around 18% of GDP. Which leads us to the third point. The senator says that taxes (or lack thereof) are the cause of a surplus/deficit. Again, that is categorically incorrect. I refer you to the US government. You’ll see that taxes, as a percentage of GDP, were actually lower in 1955 (16.1%) than they were in 2014 (17.5%) (Source: OMB, Historical Tables, Table 1.2). So why was there a smaller deficit in 1955? The government was spending less. Government outlays in 1955 were 16.8% of GDP (leading to a deficit of 0.7%) vs. 20.3% in 2014 (leading to a deficit of 2.8%). So, taxes didn’t shrink. They rose. Just spending rose faster. So, want to better understand why we have a federal deficit? It’s because spending has outpaced income (and no, higher taxes won’t work). With regard to point one I’m sure that Sanders and his cheerleaders would say that the problem is that corporations aren’t providing 33% of federal revenue, regardless of how high govt spending is; and regardless of how absurd that notion is, of course. But they never let the economic facts get in the way of a good political narrative, right? Yes, to which you’d probably get the deer in the headlights look! I agree wholeheartedly. Democrats in general are really bad at simple budget arithmetic. The only thing that I can’t figure out is whether they are really that stupid (the math is not difficult) or if they are intentionally trying to deceive people. I touched on budget issues in two blog posts that you might find interesting. Are “they” (plug in whatever politician, etc) devious/evil/dishonest/etc., or just incompetent/stupid/ignorant/etc.? The good Senator also forgets the massive income tax reforms of 1986, which reduced personal tax rates below those of C-corps, and resulted in a tremendous transition (for taxes) of corporations from C-corps to S-corps & LLCs, the income from which are passed through taxed at the individual level…. Great point. A much higher percentage of business income comes from pass through entities than in the past. This alone makes the comparison almost meaningless. It’s also a trick that people sometimes use when they want to make the effective corporate tax rate look lower than it actually is- show total corporate income (which includes both C corps and S corps) and then show corporate tax revenues (which only includes C corps). 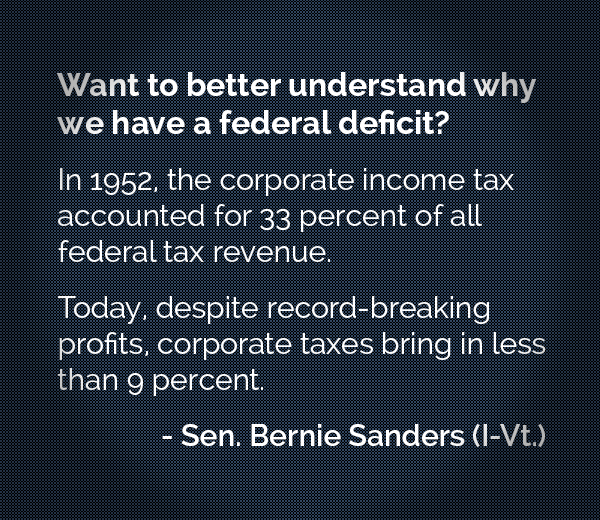 Corporations should be paying a third of the Federal budget. All we have to do is drop the personal income tax by 80% of current levels, and we will be at his magic proportions. Heck, we could eliminate all other taxes, and have corporations pay 100%! Absolutely correct. There are many things one could talk about.